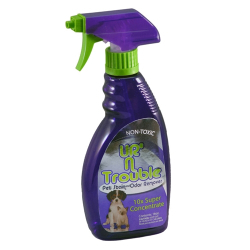 Permanently remove all your tough pet stains with UR'N Trouble. UR'N Trouble contains powerful neutralizing enzymes to discourage pets from returning leaving your home and carpet odor free. UR'N Trouble is a concentrated proprietary blend of non-toxic deep cleaning agents.